Libby Winchell knows not to take things for granted, because at any time, they might be taken away. And she's learned, controlling your mind helps to control your future. The sixteen year old Scottsbluff cowgirl is involved in a sport that not only demands physicality but a proper mental perspective. And she's had plenty of opportunity to practice both of them. At the age of twelve, she was diagnosed with optic neuritis, inflammation of the optic nerve. She was considered legally blind, with a vision of 20/400. Doctors gave her steroids to decrease the swelling, and her vision has improved to 20/200 for near vision and 20/60 for far vision, which has allowed her to drive with glasses. Then, in her freshman year, the headaches that had come and gone since sixth grade got more constant and at a level nine on the pain scale. After visits to Children's Hospital in Denver and the Mayo Clinic in Rochester, Minn., she was diagnosed with chronic migraine pain, for which there is no cure. Doctors gave her medication and taught her relaxation techniques, which have helped. But her physical ailments haven't stopped Libby from leading a normal life. She played basketball in junior high and continued her favorite sport, rodeo. The cowgirl competes in the goat tying, breakaway roping, and barrel racing. And she's competitive. Each night she and her parents practice tying goats, roping, and riding horses. The horses are on a schedule for which ones get ridden, and Libby jumps ropes and runs tires to improve her agility. Her schedule is full. "I try to get as much done as I can before I get into the house at 9 pm." Libby has learned that the mental part of life is as important as body strength and conditioning. At the River City Roundup's high school rodeo challenge in 2014, at which Libby competed, rodeo athletes were invited to attend conferences, of which sports psychologist Jack Stark was a speaker. Stark worked as a performance psychologist for the Nebraska football team from 1989-2004, and is the psychologist for NASCAR's Hendrick Motorsports team. His presentation sparked something in Libby. 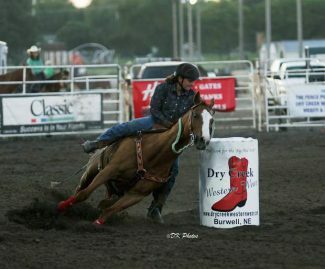 She learned to practice mental exercises to improve her rodeo runs, and it worked. "It made a huge difference," she said. "It really relaxes you." Whatever she's doing, it's working. 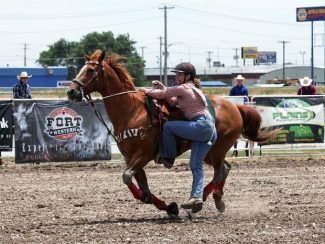 She qualified for the Nebraska State High School Finals last year in all three of her events and finished the year as the 2014-2015 Nebraska High School Goat Tying Champion. Libby practices her mental exercises in school "I hate to admit it," she said, "but there's always that one boring class," and when she's sitting in it, she's thinking about her next rodeo. "You know where you're going the next weekend, so I sit there, and I visualize my runs and what I have to do. I visualize the place itself and get my mind ready." She doesn't wear the cowboy hat at rodeos, however. Because of a fall that caused her optic nerve to swell again, the doctor suggested she wear a helmet. Another fall might cause the nerve to swell and this time, the swelling might not go down. It was hard to wear the helmet at first, Libby said, "but I did it because I needed to, and I wanted to play the game." She loves playing "the game," as she refers to her favorite sport, and she's learned how to deal with the curve balls or bad draws that are inevitable in life. 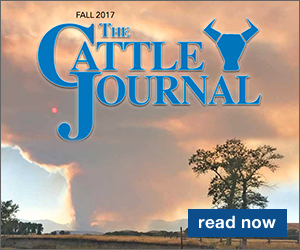 "Rodeo has its highs and lows, but you have to get your mind ready for what you have to deal with." The headaches haven't stopped, but that doesn't stop Libby. "You just live your life like (the pain) isn't there. I notice it. I'll get done with a full day of rodeo and it'll hit me, full force." But she loves the sport. "I love rodeo. I don't know what I'd do without it, to be honest. I just love the atmosphere, the competition, and the family bond." Libby has an older sister, Shelby, who is a graduate student at Chadron (Neb.) State College and on their rodeo team. She is the daughter of Mike and Shawna Winchell. The Nebraska State High School Finals Rodeo will be held in Hastings on June 18-19 at 10 am and 6 pm and at 1 pm on June 20. 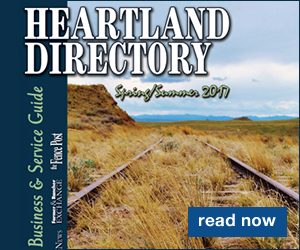 For more information, visit AdamsCountyFairgrounds.com or hsrodeo-nebraska.com, or call 402.462.3247.